You may have heard of the LEED Certification system, which is a national standard for green building. LEED is still rare in residential remodeling, due to the high costs involved in retrofitting the existing home and the rigorous third-party certification process. That being said, one of my favorite aspects of LEED is that it requires builders and designers to research every building material source, its manufacturing process, and travel distance to the job site — whether salvaged and reclaimed, extracted from an FSC-certified forest, recycled from waste products, or a renewable resource. Because the answers, especially in remodeling, can be more grey than green. The truth is, everyone from contractors to product salespeople wants to be green these days, so there is an awful lot of “greenwashing” (“clean coal,” anyone?) By the way, only a building can be LEED Certified, not a person or product. Consider bamboo, for instance. It’s one of the most popular green products available -– bamboo fights global warming by releasing 35% more oxygen than an equivalent stand of trees, it doesn’t destroy the topsoil when harvested, and it’s renewable every three to five years. Unfortunately, much of the bamboo now available is harvested overseas by countries exploiting its sudden popularity –- resulting in over-harvesting, additional shipping expense, and questionable labor practices. Now don’t get me wrong, I’m a huge fan of bamboo, its durability and warmth in addition to its environmental benefits (I recently installed bamboo flooring in my own home). I’m simply suggesting that “environmentally friendly” doesn’t mean perfect, and compromises — whether financial, stylistic, or pragmatic — are inevitable in any major home improvement project. We recently installed CFL bulbs in the new recessed lighting kits of a kitchen remodel in Fairmount. Although the bulbs were marketed as dimmable, after going a shade less bright they simply went dark. The result: out came the CFL bulbs in favor of the inefficient and energy-wasting incandescents (though the dimmers still save lamp life and reduce electrical output, both green positives). Again, good intentions tempered by practical application. 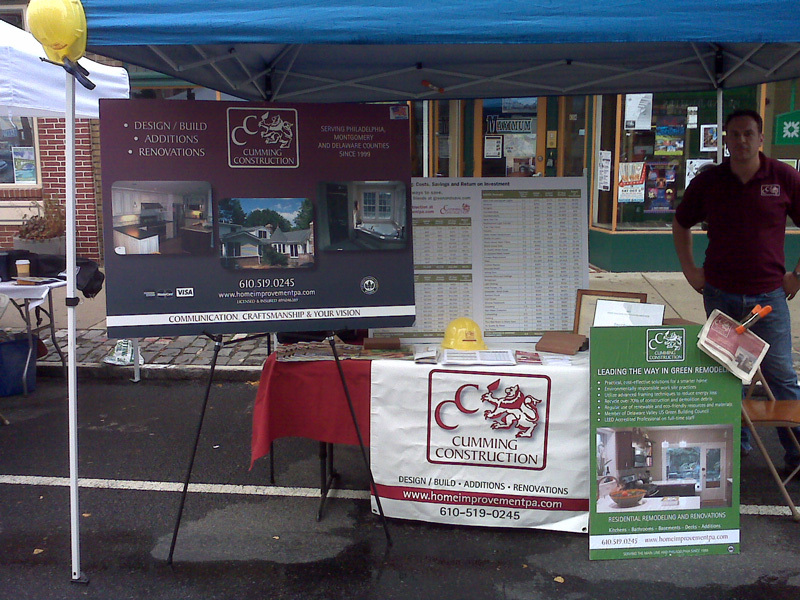 This fall we exhibited our work at two “green” events around Philadelphia — the Manayunk Eco-Fest and the GreenFest on South Street. Not only did we meet many people who appreciated our knowledge of green materials and products, but it was great to network and see what other exhibitors — from energy auditors to green roof designers — were introducing to the marketplace.